I’m at Comic-Con now, but look, another page! 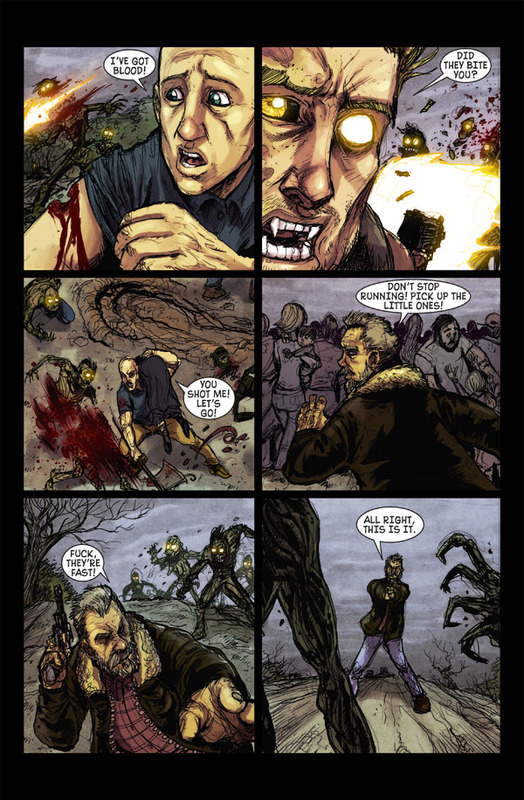 CLICK HERE TO PURCHASE LAST BLOOD COMIC BOOKS AND GRAPHIC NOVELS! Don’t forget to check out my other comics and Owen’s comics! This entry was posted on Saturday, July 24th, 2010 at 11:16 pm	and is filed under Uncategorized. You can follow any responses to this entry through the RSS 2.0 feed. You can skip to the end and leave a response. Pinging is currently not allowed. I only started reading this like a week ago, and after totally not paying attention and repeatedly checking for updates (I am ridiculously unobservant) I finally read the comments section. I don’t understand why everyone is going mad, not everything can carry on exponentially and as published comics such as The Walking Dead have proved, even if they did it would end up getting absolutely ridiculous and repetetive, to be honest I think the bonus material for this is unnecessary and a writer shouldn’t have to bend before his squealing ‘fans’ who have just given him grief over something they supposedly enjoy – be happy with what you have! I’m a little upset to find out that you really don’t like your work, but to be honest I agree with you to an extent, the concept is much much better than where the comic went – I’m not being horrible with that, I just think its true. almost a year and still no update??? really like to see it continue so…. Got nice story inside it! I’m just new and finish it in a day all your “Last Blood” pages. Needed 5 hours. The first story is bit scary tough… Because I like zombie stories, this is giving creepy for those who survive the last. And I realize this not update for 11 monts. Almost a year. Sorry if you become upset because of my second paragraph (Both 1st and 2nd replies). Before I checked all comments, I was thinking ,”All of the comic is stopped maybe because it’s already finish, no need bonuses.” After check the comments, need to say sorry I think. Go Bobby. Can’t say I agree with comic sucking, but considering how good marry me and dreamless was, I am grateful for the freebees I already got. Hope Last Blood won’t eat all of your time and we will see a new project from you soon. Keep up the great work. Hope the movie works out, then I ll bring two friends to the theatre and then the volume may be 1 mil instead of .5? Check once a month because I love the originality of your story. Thank you for all your hard work thus far. People, stop complaining, you didnt pay for it! This dude has heaps of stuff to do, as he said, this continuation was not originally planned, and entirely for the fans. I personally think its better for him to put more energy behind other storylines, because I’ve read Dreamless, Marry Me and now Last Blood, and loved them all so far. Cut him some slack, hes busy making a freaking movie of this. Almost a yr!!! Please hurry!! It’s been almost a year please update soon!!! Never posted a comment before, and never read them (not because I’m lazy, but because I knew I wouldn’t be able to control myself if I read some stupid comment on here), but I read all of them for this page just to see why it hadn’t been updated. Saw what you had to say about the comic being over, and how you hated it, and what other people had to say about you not doing it anymore (not pretty). I’ve also noticed you haven’t posted your own comment on here for a while, which means you’ve either given up on trying to explain things to people, or you haven’t bothered to check the comments because of that fact, which means the post is for naught, but alas, I’m going to post it anyways. Well, all I’ve got to say is that the comic belongs to you, therefore you hold the exclusive rights to not continue the bonus pages, for whatever reason you have (and you gave a pretty good one). Also, its fine that you hated this comic, since the creator probably knows more about the direction he was trying to take it than his fans did. I’m surprised at the people who are surprised that you hate it. I’ve never made any judgments about people over the internet, since its hard to know somebody through a computer screen and a keyboard. I also don’t know where I’m going with this post anymore, so I’m just going to say, I liked it, good luck with any future comics, and I hope the movie does well, though I’m probably not going to go see it. Crowded places like theaters bug me, so I’ll probably just wait to rent it On Demand or something. Holy sh1t, going on two years with no new pages. Love the comic, but a dead comic is a rotten comic. Enjoy life, screw us unhappy readers.